The torch for the Beijing Olympics has completed an incident-free relay run in Tanzania, bringing respite from its so-far troubled world tour. 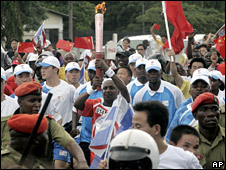 The torch went on a shortened relay in the commercial capital Dar es Salaam amid tight security. 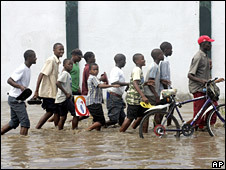 A cabinet minister and a UN under-secretary general joined about 80 athletes amid heavy rain. Thousands of protesters angry over Tibet and China's human rights record have dogged the route on other legs. The torch was lit in Dar es Salaam by Vice-President Ali Mohamed Shein and passed to minister Mohamed Seif Khatib, who led the team. UN under-secretary general and executive director of UN-Habitat Anna Tibaijuka also carried the torch, on its shortened 5km (3 mile) route. About 1,000 people marched alongside the team, waving Olympic flags and chanting slogans of support. Mr Shein said: "I am excited that Tanzania is the only country out of 53 African nations to host the relay. This is a rare opportunity for our nation and a challenge for the government and the people to promote sports." The BBC's Daniel Dickinson in Dar es Salaam says the Chinese are generally welcome in Tanzania and it was no coincidence the relay passed the Tanzania-Zambia railway, which was constructed with Chinese support in the 1970s, and ended at the recently built national stadium, which was also funded by China. One controversy that did hit the Tanzanian leg was the withdrawal of Kenyan Nobel peace prize winner Wangari Maathai, who said the Olympic flame had now become a symbol of disunity. The torch's journeys through Paris, London and San Francisco were all disrupted by heavy protests. Its next destination is Oman in the Middle East on Sunday night.